There are currently no comments available for Thomas Bryant. There are currently no comments available for Stephen Zimmerman. i think he's good. been figuring it out 2nd half the season. slowed himself down a bit. Russell too. well the first google result for "ben simmons jump shot" is Ben Simmons might be shooting with the wrong hand so that's probably not good. Simmons has attempted 265 non-jumpers so far this year. Despite being a left-handed shooter, only 10 of his non-jumpers were released with his left hand, 39 were with both hands, and 216 were with his right hand. "ben, do you think you might be.....right-handed?" that article seems a bit unfair in a specifically woj way but also ingram does seem better? i'm willing to give simmons a bit of a pass on the shooting stuff since it seems like he doesn't even have the basics -- i.e. which hand is your dominant hand -- down. like if he could even build up to a lebron-esque game of finishing very well at the rim with a midrange jumper that comes and goes and a passable three point shot then he should be a star given the rest of his game. but lebron is also a crazy unique individual so i see where the concerns about simmons' make up come in, it just seems a bit early to fault him. You know who Simmons reminds me of is Greg Monroe. was there a heated argument about monroe on this board in the past few days or did i dream that? it happened about 24 hours ago! it's hard for me to look at him and not think "this guy is going to be very very good in the nba"
his shot looked unbelievable tonight and you have a pretty high floor if you can shoot like that. i think the question about him is if he's athletic/quick enough to consistently generate his own shot but given how the game is right now that shot would still make him a pretty valuable player. not exactly the most encouraging group. butler the only franchise player, faried and mccollum arguably close. a lot of role players and busts in that group. also had draymond and jae crowder as second round seniors. I figure he'll be taken somewhere between picks 10 and 20.
wasnt damian a senior taken in the last 5 years? nah jr. might have been a fourth year jr. tho? huh yeah i think he was 22, figured he was a sr.
feel like hield should at least be as good as mccollum. fwiw mccollum also just had an insane shooting year as a senior. The nuggets def have too many players... 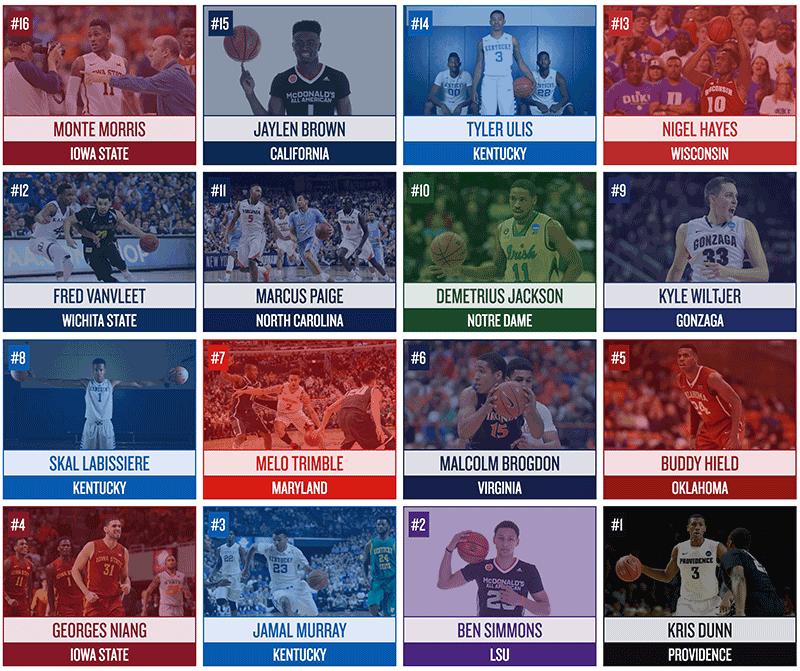 They're at least 2 deep at every position other than PG (and Augustin isn't half bad). although that includes 2 SFs who are always injured. Maybe time to move faried. wow, he is really high on him. as much as people have talked about length in recent years, it's interesting that simmons is notably not long for a 6'10" guy. yeah, maybe not, different sources have different numbers, and he didn't do the official combine measurements. he does not look 6'10" irl, might be 6'8"
The knock on Simmons as a shooter is somewhat overrated. Let's not forget that another do-it-all type of NBA star was not a good shooter in college. In two seasons, Kawhi Leonard shot 20.5 percent and 29.1 percent from 3, yet is a career 39-percent shooter in the NBA -- making 44 percent this season. Simmons has a good-looking stroke, but he never looked as if he was willing to take 3-pointers, and was hesitant to take a lot of jump shots, period. Perhaps this was due to a coaching decision, as he was able to drive by or pass over most defenders. 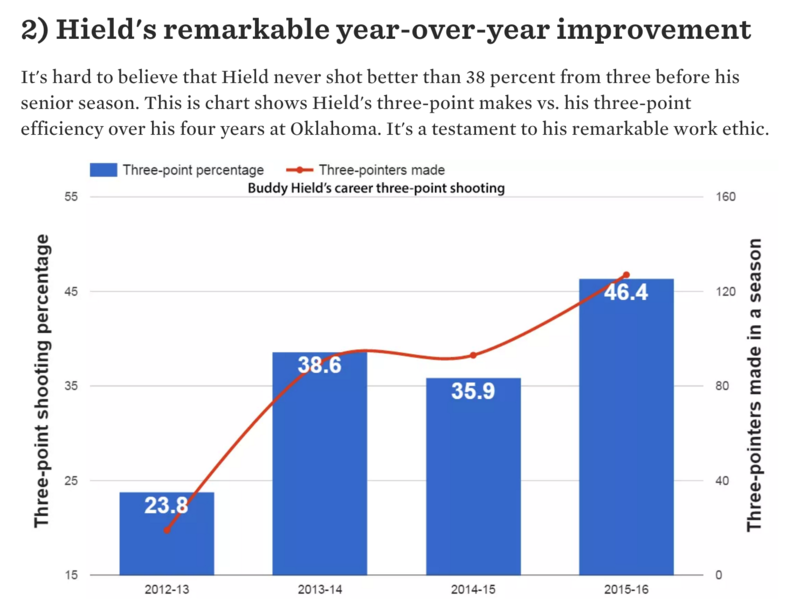 In the NBA, it is fair to expect he will shoot a lot of 3s and be at least good at it, in time. Still think this draft is terrible. This is the draft where I'm gonna be that guy finally. blazers have no picks this draft. I am pretty non-committal about it. it will be interesting to see who gets simmons and whether he is worth his salt. Who would you take with the second pick in this draft?